Boot oil is a go-to leather preserver for everything from work boots to dress boots. But what exactly is boot oil? And who makes the best oil for leather boots? We have put together a helpful guide for those of you who want the 101 on this popular boot and shoe waterproofer and preserver. Huberd’s makes some of the best oil for leather boots thanks to it’s special formula that helps waterproof, soften and preserve leather. Huberd’s Shoe Oil is a thick brown liquid that will darken leather when applied. It has a smokey wood smell that isn’t too overpowering but worth mentioning in case you are sensitive to odors. 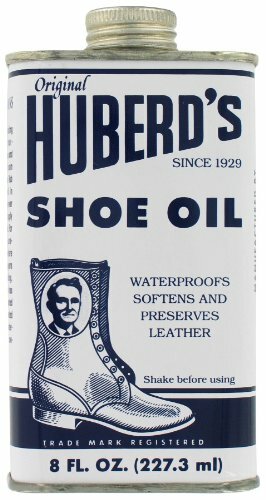 One of the reasons we recommend Huberd’s Shoe Oil is because it’s safe to use on fine leather boots that need to be shined or polished. 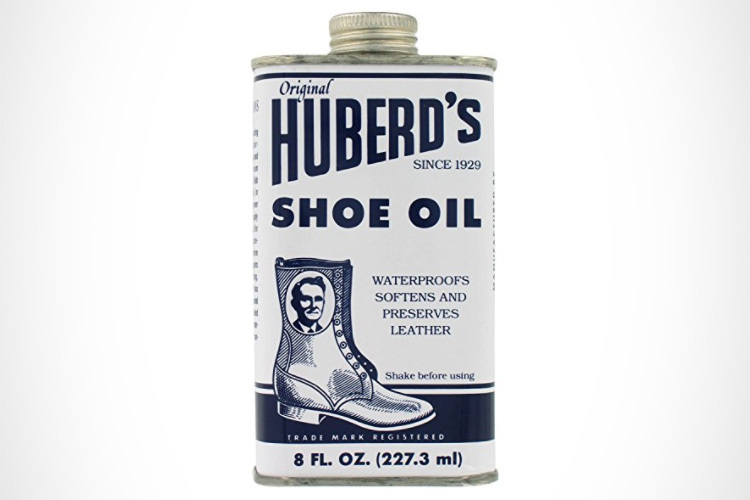 In fact, Huberd’s Shoe Oil formula was originally intended to help waterproof and condition leather sole dress shoes. Why is Huberd’s the best oil for leather boots? We recommend Huberd’s shoe oil for anyone looking for a versatile boot oil that be used on a variety of leather boots, shoes and goods. Many boot oils on the market contain ingredients such as mink oil, neatsfoot oil and waxes that can be too heavy for most dress and casual boots. Instead Huberd’s sticks to natural ingredients such as beeswax that creates a breathable barrier against moisture that defends leather from mildew and rotting. What you won’t get with Huberd’s is that thick gunky layer of grease that usually stays behind when using heavier products, this is the main reason we recommend Huberd’s as the best leather oil for dress boots. It’s thinner formula allows for the leather to be polished or shined after oiling. Anyone who owns a nicer pair of dress boots will love the protection Huberd’s shoe oil has to offer. Does Huberd’s Shoe Oil darken leather? Huberd’s shoe oil will darken leather when first applied if used on brown or lighter color leathers. As with any boot oil, it’s best to give the oil time to penetrate the leather before wearing again. Expect your leather boots to be significantly darker on the first day of applying Huberd’s and then lighten over the course of a few days as the oil settles into the leather. Huberd’s shoe oil can be applied using a clean cloth or an oil daub applicator that can be purchased separately. Make sure to cover all of the leather uppers in an even coat. Like any boot oil, it’s better to apply multiple lighter coats than one heavy coat. So take your time, allow your boots to dry and reapply Huberd’s Shoe Oil as needed. Huberd’s offers a variety of leather conditioners that include their popular shoe oil and shoe grease. While shoe oil is perfect for finer dress leathers, Huberd’s Shoe Grease is a heavier formula that is better suited for outdoor boots that come into contact with mud, salt and other harsh elements. Although both conditioners use beeswax as an ingredient base, it is not recommend to use Huberd’s shoe grease on boots that need to polished or shined. Obenauf’s makes some of the best oil for work boots thanks to it’s conditioning properties that allow it to restore and preserve leather that is routinely exposed to the sun, salt and moisture. It also can be used on casual and dress boots that need to be shined or polished. The formula includes beeswax, a natural leather conditioner that also helps with water resistance while still allowing the leather to breathe. Why is Obenauf’s the best oil for work boots? Obenauf’s takes the spot of best leather oil for boots on the market with their very own conditioning oil blend that fights dryness and helps resist dry rot, scuffing and cracking. What makes Obenauf’s oil blend so highly rated is it’s ability to be used on different types of leathers. The formula is effective enough to use on tough leathers found in work boots yet gentle enough to still allow for dress boots to be polished and shined after an application. For those with new boots, Obenauf’s special formula helps eliminate painful break-ins by relaxing the leather enough to allow the boots to form to your feet. This is a great feature for those who have just purchased a new pair of expensive boots that need break-in or for those who go through work boots often and need a fast way to break them in. The second reason Obenauf’s makes the best oil for leather boots is it’s ability to prevent damage from moisture as well as dry-rot, cracking and scuffing. The formula is perfect for winter boots that come into contact with lots of water and moisture as it helps prevent damaging water penetration while fighting mold and mildew. What is Obenauf’s boot oil made of? What makes Obenauf’s boot oil so highly recommend is the brand’s use of all natural ingredients. Obenauf’s boot oil is made of a blend of natural plant oils, beeswax and propolis. Propolis is a natural compound produced by bees from the sap of trees and is actually used in the medical industry because of it’s antibacterial, antiviral and antifungal properties. How do I apply Obenaufs boot oil? Each bottle of Obenauf’s boot oil comes with an applicator dauber that is attached to the lid. This allows for easy application to leather boots, shoes and other small to medium sized leather items. 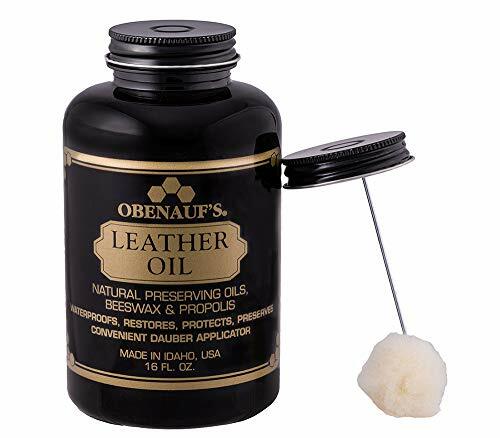 To apply Obenauf’s use the dauber to work in the oil into the leather by covering the entire leather surface of your boots. Make sure to apply the oil evenly to prevent any streaking or marks. You can repeat the oiling process as needed. Less is more when it comes to boot oil. Obenauf’s recommends that you apply multiple lighter applications instead of one heavy application. How often Should I apply Obenaufs? Obenauf’s leather oil should be applied whenever your boot leather looks dry and in need of hydration. You’ll know it’s time to apply boot oil when your boots are cracking, splitting or when the color of the leather is washed out. Work boots and outdoor boots should be a oiled more often than dress boots as they are usually exposed to harsh leather drying conditions. Does Obenauf’s leather oil darken leather? Yes, Obenauf’s leather oil will darken your leather boots. When leather has been dried out it will lose it’s color and appear pale and washed out. The purpose of leather boot oil is to replenish your boot’s natural properties by adding a hydration layer to the leather. This process will darken boots as they are hydrated and restored to their original condition. To find out how much your leather boots will darken, we recommend that you apply a small amount of Obenauf’s leather oil in a inconspicuous area to test before oiling the entire boot. Boots with lighter color leathers will see darkening after Obenauf’s leather oil is applied. Darker colored boots may also see a change in their color as the oil penetrated the leather to give it a richer appearance. Please note that leather oil can take up to 7 days to completely do it’s thing. So your boots may experience a darkening that lighters over time as the leather boot oil seeps into the leather fibers. A common inquiry is whether there is a difference between Obenauf’s and Huberd’s boot oils. The easy answer is to use Huberd’s boot oil on dress boots and shoes that are made of finer leathers while Obenauf’s can be also be used on hardwearing leathers such as work boots and outdoor boots. When it comes to ingredients, both boot oil brands use beeswax as a main waterproofing and conditioning ingredient. Beeswax allows for breathable layer of protection that is much thinner than heavier oils such as mink and neatsfoot. This allows both Obenauf’s and Huberd’s to be used on dress boots and shoes. But out of the two, Obenauf’s ingredients makes it a better choice for thirsty hardwearing leather usually found outdoor and work boots. Red Wing offers their own boot oil made with pine pitch and mink oil. The mink oil helps with waterproofing leather and pine-pitch is a natural leather preserver that keeps leather hydrated and healthy. We recommend Red Wing Boot Oil for oil-tanned leather boots and hardwearing work boots that need extra protection from harsh environments. What is Red Wing boot oil made of? Red Wing All Natural Boot Oil is made of a proprietary blend of pine pitch and mink oil. Pine pitch is a naturally occurring resin that comes from pine trees. Mink oil is a natural leather waterproofing agent that comes from mink skins. Together these ingredients create a natural barrier that waterproofs leather while still allowing it to breathe. 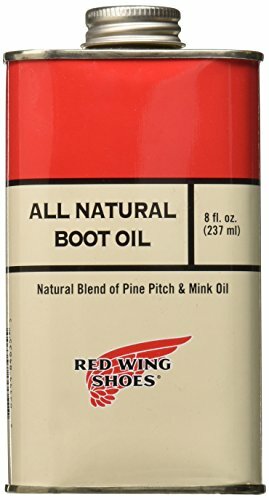 Can you use Red Wing boot oil on most boots? Before you use Red Wing boot oil on other boot brands such as Clark’s, Chippewa, Thorogood and Filson, first make sure they are the right type of leather. Red Wing specifically made their All Natural Boot Oil to address the conditioning needs of oil tanned leather. Nappy leathers such a suede and nubuck will be ruined by Red Wing boot oil. Because of it’s use of mink oil, Red Wing’s boot oil does not allow leather to be shined or polish afterwards. So it’s best to avoid using Red Wing boot oil on fine dress leathers such as calfskin or any leather that is to be polished after conditioning. What is Naturseal boot oil by Red Wing? While Red Wing’s All Natural Boot Oil is better suited for oiled leather, Naturseal boot oil by Red Wing is especially made for conditioning waterproof leathers, dry-tanned leather and even nubuck. The Naturseal blend is a conditioning formula made to penetrate waterproof leathers while enhancing breathability and pliability. The difference between Naturseal and Red Wing boot oil comes down to Naturseal being better suited for conditioning already waterproof leathers while Red Wing Boot Oil being a better choice for oil tanned leather that have become dry over time and need additional waterproofing. Although Naturseal can be used on just about any kind of leather, Red Wing recommends that you keep use of Red Wing All Natural Boot Oil to just oil-tanned leathers. Unlike Red Wing boot oil, Huberd’s shoe oil is able to be used on dress boots and shoes that need to be polished or shined after conditioning. Red Wing boot oil is made especially for oiled leather boots which are not made to be polished or shined. Huberd’s is made out lighter ingredients such as beeswax and conditioning oils that allow for moisture protections while still allowing fine leathers to breathe. Red Wing boot oil on the other hand uses mink oil and pine pitch which create a heavier barrier better suited for rough leathers such as oil tanned leather. Red Wing boot oil is the better choice for anyone who owns oil tanned leather boots. Choosing Red Wing boot oil vs mink oil is as easy as getting to know the differences between the two oils. Red Wing boot oil contains mink oil in it’s preparatory oil blend while mink oil is just mink oil by itself. No, duh. But what’s the difference? Red Wing boot oil’s blend of mink oil and pine pitch creates an oil that is much thinner than mink oil and as a result acts as a moderate leather waterproofer. Mink oil will create more of a waterproof barrier but will also apply a bit thicker which can attract more dust or dirt if not applied correctly. For more information on the differences between boot oil and mink oil check out our in depth answer below where we cover the pros and cons of each type of boot oil. Boot oil is a type of leather conditioning oil that is safe to use on shoes and boots. Boots that are dry, sun-faded and experience lots of wear will benefit the most from an oil treatment as boot oil restores moisture to the leather and protects it from further damage. Another benefit of boot oil is that it can defend the leather against mildew and moisture that can rot the leather over time. A good boot oil penetrates your boot’s leather and creates a barrier that repels water, salt and other harsh elements that can harm leather while still allowing your leather to breathe. Boot oil is great for winter or work boots that experience a lot of abuse in harsh environments yet some boot oils are gentle enough to use on dress boots by still allowing them to be buffed to a shine or polished. What is boot oil made of? Here we do a deep dive into some of the most common boot oil ingredients so that you can be more informed when choosing your next leather boot oil. Beeswax is the wax secreted by bees as they make honeycombs while propolis is made from tree resin that is picked up by bees as they pollenate. Both beeswax and propolis are common ingredients used in boot oils for their all natural water-repellency, antibacterial and leather lubricating properties. Beeswax is a popular ingredient in many leather conditioners because of it’s natural water resistance. Beeswax does not seep deep into the fibers of the leather like other boot oil ingredients. Instead it sits on the top layer of the leather and creates a barrier that repels water and moisture. Although beeswax does not soften leather, it does provide enough lubrication to prevent the leather fibers from hardening, cracking and splitting. Unlike other oils derived from animal ingredients, beeswax and propolis does not run the risk of rotting your leather after prolonged use. This is a big issue with some of the animal-based boot oil ingredients that beeswax dodges thanks to it’s natural skin preserving properties. Beeswax is safe to use with Gore-Tex boots and other similar liners because beeswax only penetrates the outer leather layers of the boot while Gore-Tex acts as an inner liner. Unlike other boot oil ingredients that may clog leather pores, beeswax keeps the leather breathable which helps Gore-Tex and other boot liners to do their thing uninterrupted. Mink oil, a natural leather preserver, comes from the pelts of minks. Mink oil can come as a stand-alone boot oil or as an ingredient in a boot oil blend. It’s traditionally made from oil that is found in mink pelts but many of today’s mink oil is actually a blend of real mink oil and other synthetic and natural oils. There are a lot of do’s and dont’s when it comes to mink oil that we cover in-depth in our What is Mink Oil? guide and although we will give you a quick rundown here we recommend you read the full article if you want to learn more about using mink oil on your boots. Mink oil should be reserved for hardwearing leathers found in work boots, outdoor boots, and winter boots that come into contact with lots of moisture. Do not use mink oil with your nicer shoes or boots as mink oil has a reputation for ruining finishes and significantly darkening leathers. So avoid boot oils that have mink oil in the ingredients if you are looking to oil your dress boots. For hardwearing leather boots, such as your work boots that you beat up in the sun, mink oil does a great job as a waterproofer, moisturizer and leather softener. It has the ability to deeply penetrate leather to moisturize and condition. Neatsfoot oil comes from the shin and feet of cattle. Neatsfoot oil is an animal-derived leather preserver that comes from the feet and shin bones of cattle. Like mink oil, neatsfoot oil can come as a standalone product or as an ingredient in a larger boot oil formula. Neatsfoot oil is used in many leather conditioners because of it’s ability to deeply penetrate leather and lubricate it’s fibers. This prevents common issues caused by dryness such as cracking, splitting and scuffing. Some neatsfoot oil of today isn’t actually made from the bones of cattle. Instead you are more likely to find a variety of “Neatsfoot” oils that are actually a blend of other ingredients to mimic the properties of real cattle-derived neatsfoot oil. When shopping for standalone neatsfoot oil you will run into two different varieties; Prime Neatsfoot Oil and Pure Neatsfoot Oil. Prime neatsfoot oil is a mixture of adulterated neatsfoot oil, petroleum based products and essential oils. While Pure neatsfoot oil is usually made from animal oils, lards and fats to create blend close to real neatsfoot oil. Because of it’s deep penetrating properties, neatsfoot oil will darken your leather when used. It can also leave an oily residue that can attract dirt and debris. Because of these properties, it’s best to avoid using neatsfoot oil on anything but hardwearing leathers such as those found in work boots, cowboy boots and outdoor leather boots. Pine pitch is a naturally occurring substance that comes from the tree sap in pine trees. Pine pitch is often an ingredient in leather oils because of it’s natural water-resistant and anti-bacterial properties. Since boot oil is not the best smelling, pine pitch is often added to add a clean fresh pine scent to boot oils and conditioners. Because of this fresh scent, pine pitch is safe to use on hunting boots as it’s scent does not scare away animals. Pine pitch is different from pine tar or black tar which also comes from trees and is sometimes used as an ingredient in leather conditioners. Use of tar should be avoided in leather conditioners as it can harm your leather over time by breaking down the fibers and shortening the lifespan of your boots. Mineral oil is a popular ingredient in leather oils and conditioners because of it’s ability to soften and waterproof leather. Because of it’s softening ability, mineral oil should only be used on stiff and rough leather as it can oversaturate softer leathers. Mineral oil also has a reputation of darkening boots so it’s best to avoid using mineral oil on light leather colors. Unlike other breathable leather conditioning ingredients such as beeswax, mineral oil can actually clog up leather and destroy it’s breathability. Less breathability means moisture can get trapped inside the leather and create a situation where your leather is prone to deterioration and rot over time. Many boot oil brands avoid using mineral oil in their formulas because of this issue. A lot of mineral oil found in boot oils are a distillate of petroleum. Boot oil brands may not straight out say they use mineral oil in their formulas but you may hear terms like “petroleum by-product” instead. It’s growth in popularity is due to mineral oil being odorless, tasteless and food grade. It’s also very cheap when compared to other waterproofing ingredients so it’s a popular way for companies to cut costs. “Natural oils” is a catch-all term for oils derived from plants or animals. Plant based ingredients usually come in the form of seed oils and resins. Animal-based ingredients can come in the form of mink oil or neatsfoot oil as covered above or in the form of beaver, seal or cattle derived oils, fats and lards. Clean your boots before oiling them. It’s important to remove any dirt or grime from the leather as this can cause discoloration, streaking or prevent the oil from penetrating into the leather. Test the oil in a small inconspicuous area before oiling your boots for the first time. Oil can darken leather boots so its’s important to make sure you are ok with the final results before oiling the entire boot. Use an applicator (if included) or a clean cloth to work the oil evenly on the leather uppers. Less is more. Apply only a thin coat at first. Work the oil evenly across the entire surface of the leather. Do not saturate the leather in oil. Wait an hour for the oil to fully absorb into the leather before a second application (if needed). After oil has been absorbed buff out with a clean cloth or horsehair brush to remove any excess oil. Dry and brittle leather is a sign that you need to oil you boots. How often should you oil your boots? Can you over oil leather boots? A little oil can go a long way and it’s important to keep this in mind when oiling a pair of boots. Over-oiling your leather boots can be as disastrous as not oiling or conditioning them at all. The oil can cause unsightly staining or streaking and can actually damage the leather over time. Too much oil can cause your leather boots to lose their natural breathability and can deteriorate the leather causing splitting and leather separation. Although boot oil and mink oil share many similarities they are also different in purpose. Mink oil is a heavy substance that should only be used on hardwearing leathers such as those in work and winter boots. Mink oil waterproofs and conditions leather but also removes the ability for the leather to be buffed to a shine. Once on, mink oil can be impossible to wipe off and it can essentially ruin dress boots. Boot oil on the other hand is a thinner substance and allows a boot to be shined and polished afterwards. Although not as heavy duty as mink oil, it can still help waterproof and preserve leather. We like boot oil as an all around leather waterproofer and conditioner because it’s safe to use on all kinds of smooth leather and is a great option to hydrate, preserve and protect leather uppers. If you would like to learn more about different kinds of leather boot conditioners then make sure to check out our leather conditioner guide. We are often asked if boot oil is safe to apply on certain types of boots and with so many different types of leathers we can understand the confusion. The truth is, leather boot oil is only one kind of leather conditioning product and it’s best used on only finished leathers. Below we cover a few different types of leathers and explore whether or not you can treat them with boot oil. Oil tanned leather (or oiled leather as it’s sometimes called) is a type of leather that has been treated with oils during the tanning process. The end result is a thick, long lasting leather with high water resistance. Oil tanned leather is a popular choice for shoes and gear that needs to be able to survive a beating; work boots, hiking boots, boat shoes, cowboy chaps and even bags. One benefit of oil tanned leather is that it generally needs less care and coddling than other types of leather. The fact that it is treated with oils means it’s less prone to cracking, staining or drying. But as with any leather, you still need to make sure that oil tanned leather is properly hydrated. This is especially true when oil tanned leather comes into prolonged contact with moisture, salt, chemicals and dirt that can dry out the leather. You will know it’s time to use boot oil on your oil tanned leather boots when they no longer have that dark oily sheen to them. When your oil tanned boots look dull and thirsty you’ll know it’s time for an oiling. The best boot oil for oil tanned leather is one made from natural ingredients. Stay away from boot oils that contain mineral oil and petroleum as these can negatively affect your boots breathability. Instead stick to beeswax, mink oil and other natural oils that allow your boots to breathe while restoring the leather’s water resistance. What we refer to as dress leather can best be described as any leather that can be polished or shined. Dress boots differ from your work or snow boots as they are usually made of finer leathers that need a more delicate care routine. A good rule of thumb is to avoid boot oils containing mink oil as it can ruin the shine on your leather. Instead stick to a boot oil that has a beeswax base such as Huberd’s Shoe Oil. With dress boots, darkening may become more of an issue as many people like to match their shoes with their belts. Remember, all oils darken leather so make sure you are ok with changing the shade of your expensive dress boots before oiling them down. You are also going to want to avoid using boot oils on fine dress leathers such as calfskin. For finer leather stick with special conditioning products that won’t stain or ruin your boots. You can use something like Saphir Renovateur as recommended on our leather boot conditioner guide for fine leather boots. Don’t use boot oil on shell cordovan. Shell cordovan is an hardwearing leather that comes from a horse’s behind. It’s known for tight fibrous structure that makes it tough as nails and a perfect choice for boots and shoes. Shell cordovan is already naturally oily thanks to it’s tanning process so you aren’t going to have to routinely oil it like with other leathers that dry out quickly. In fact, the oils inside the leather can be “drawn out” by simply rubbing your fingers on the shell cordovan and giving it a quick massage. No boot oil needed. Instead what you are going to want to use is a special leather conditioner or polish that’s safe to use on shell cordovan. We recommend using a little Venetian Shoe Cream to condition your shell cordovan boots or shoes. Venetian shoe cream does a great job at restoring luster to shell and it comes in a variety of colors so you can match your shell cordovan boots and give them a nice polish. Horween Chromxcel (or CXL) leather is a pull-up leather which means it’s one of the most oily and fatty leathers around. Because of how much oils and greases are used in the tanning process, using boot oil on chromxcel can be overkill. Instead we recommend you clean your chromxcel boots often with a brush and condition only once every 6 months if the boots have seen enough wear where the leather is starting to look thirsty. 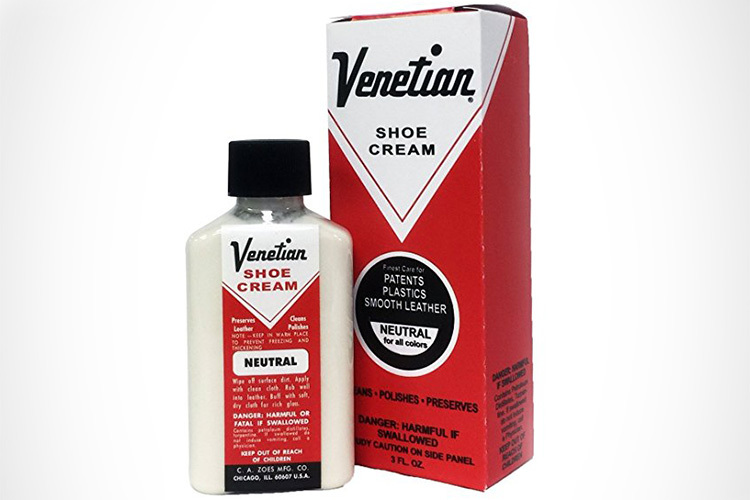 We recommend that you use a small amount of Venetian shoe cream to nourish chromxcel and add some shine. Do not use boot oil on suede or nubuck boots. Nappy leathers such as suede, nubuck and roughout should not have boot oil applied to them as this can ruin the nap. Instead we recommend you use a conditioner or waterproofer in spray form. For a full rundown on how to clean and care for suede and nubuck please check out our How to Clean Suede Boots guide where we recommend the correct products to clean and condition your suede, nubuck and roughout boots. Before applying boot oil on cowboy boots it’s important to find your leather type before proceeding. For oil-impregnated or oil tanned leather cowboy boots, using boot oil is recommended when the leather gets too dry. See the oil-tanned leather write-up above to find out when to apply boot oil on oil tanned leather boot. Using boot oil on cowboy boots that can be polished should stick to boot oils such as Huberd’s Shoe Oil or Obenauf’s Leather Oil that allow the leather to be polished afterwards. Polishable leathers should avoid boot oils with mink oil as a main ingredient as this can ruin it’s shine. Cowboy boots made from a snuffed finish or suede should avoid using boot oil as this can ruin the nap and permanently discolor the leather. Cowboy boots made out of exotic leathers such as lizard, crocodile and ostrich should find conditioners that are safe to use on those leathers. Most boot oils and leather conditioners are made for cowhide leathers and not for the properties of exotic leathers. For more in-depth guide on how to clean and condition your cowboy boots based on their specific leather Dan Post actually has a great cleaning guide broken down by leather type.